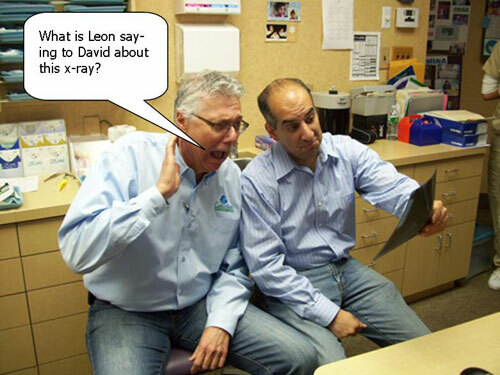 Leon and David are reviewing x-rays together in the lab. They ran across something very peculiar in this one x-ray. Obviously they were both surprised. What do you think Leon is saying to David? Include your first and last name so we can notify you if you are the winner. The winner will be decided by the Coolsmiles team on March 31st. The winner receives a $50 gift card. Please, only one submission will be accepted per person. Is that a toy car I see stuck up his nose? I though they were only kidding when they asked if this place was a zoo! So THAT’S where that Lego went! Who knew? Yikes… i DID lose my ring on that last retainer prep! Holy cow, is that even physically possible? I’m switching to internal medicine. I thought she said that she lost her retainer!…..
Havent i told you not to put braces on a beaver??!! Even if they have it on for life the braces wont fix anything!! plus theyre dangerous…..they can bite off your hand!!! That tooth decay really spoiled the day! Last time I saw a mouth like that, it had a hook in it! What! I thought this was the doctors office. That must be why I’m looking at teeth instead of my back! !